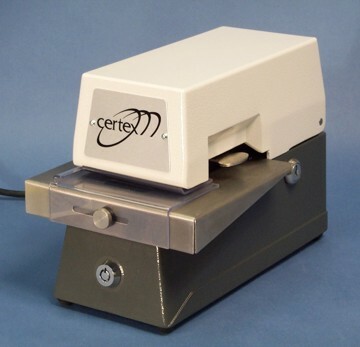 Productivity will increase when you use Certex Products to print, protect and sign your checks in one operation. The 3200 has the ability to digitally store forms, so it can be used to create entire documents. Checks, money orders, cashiers checks and certificates, including the MICR line, can be printed on blank safety paper. Dual locking system is the ultimate in control. One lock turns off the electronics when not in use. The other lock prevents access to the signature plate by unauthorized personnel. The unique design lets you interchange the signature plates horizontally or vertically. The entire plate is removable for security when not in use. 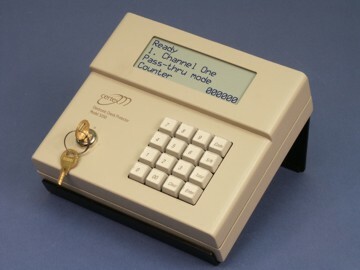 Non-Resettable counter that records number of impressions for unit control. The non-resettable counter records number of impressions made. Single, double or triple signatures that can be used with a solid or three-color ribbon. The signature plates can be inserted horizontally or vertically. Just insert your check... and the switch is automatically tripped to imprint your signature. The rugged, all-metal construction is designed to perform indefinitely. The signature plate is made of a Miraclon, an indestructible polymer. Dimensions Height: 7.5" Width: 6.5"
Maverick MICR Encoders ensure the accurate, reliable and most economical method of qualifying exception items at the Point of Entry. Maverick's family of exception item encoders, allow you the flexibility to tailor hardware purchases for your specific needs. Maverick's industry standard Proof Of Deposit (P.O.D.) Software provides high performance and reliability in a tabletop MICR Encoder / P.O.D. System. ATM Settlement and enhanced Batch Processing Applications are also available. Our Maverick M-366 Exception Item Encoder Series offers the perfect solution for your exception item check encoding needs. All of the features of our popular M-360 with the addition of a highly visible back-lit display. A very small footprint and programmable field keys make the M-366 the most user friendly check encoder on the market. All M-366 encoders ship with your exception item fields pre-programmed and ready for use! Cartridge ribbons make your ribbon changes a snap! Full field encoding, 10 key entry and easy to read display make the M-366 the perfect answer to exception item encoding needs! • Amounts are printed with unique, double-height numerals that prevent alteration. • Regular or Reverse imprints further secure the amount imprint. • Special prefix and suffix imprints prevent additional numbers being inserted. • Custom prefixes available for added security and control. • Triple key/lock control prevents unauthorized access to general operation, executive functions and signature eprom. • Programmable Password option provides added security against unauthorized usage and detailed audit control. • Unique "Void Over" statement further enhances amount security. • Programmable Check Number option improves document reconciliation. • Account and signature suppression limits improve managers' control over high amount disbursements. • Multiple signature format, titles, logos and security backgrounds available. 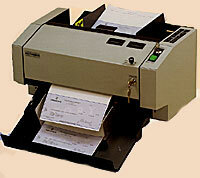 The HE-1500 is a one-step stand-alone check disbursement audit machine. The HE-1500 will write monetary amounts on documents with font designs to thwart alteration. 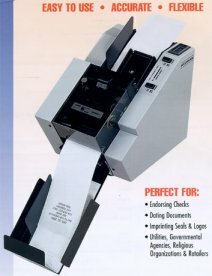 The HE-1500 is capable of protecting monetary amounts with unique double-height fonts, and also provides reporting capabilities for total audit control. Programming for up to 4 separate check types. Amounts are printed with unique, double-height numerals designed to stifle alteration. 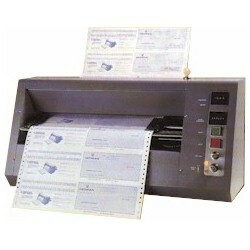 Regular or Reverse imprint designs further secure the amount imprint. Special prefix and suffix imprints prevent additional num6ers from being inserted. Custom or standard Prefixes are available for added security and control. Dual key/lock controls and Executive Passwords prevent unauthorized access to general operation, executive functions and prefix eprom. Programmable Password option provides added security against unauthorized usage and detailed audit control. Unique "Void Over" statement further enhances amount security. Programmable Check Number option improves document reconciliation . Account limits improve manager's control over high amount disbursements. Processes checks for four separate disbursement accounts, even if each account uses a different size or style check. Three different reports list, summarize and total all transactions for simplified reconciliation. The DI-100 imprinter from Hedman allows for a variety of imprint designs such as signatures, endorsements, seals and logos with either standard or optional oversized imprint plates. Dual key/lock controls provide maximum control over the imprinting function. Non-resettable counter counts imprints only when imprinting function is activated via the Imprint Key. All Metal construction with tamper-proof screws provides total security. Executive key/lock prevents unauthorized access to imprint plates. Optional Tri-color ink roll provides added security to each impression. Ease of Operation: External dial allows for "on the fly" ink roller adjustment. Imprint plate loading is made easy by Hedman's exclusive latch-load holder. Allows for a variety of imprint designs such as signatures, endorsements, seals and logos with either the standard or optional oversized imprint plates. Imprints can be placed virtually anywhere on the document. Easily adapts to any single part document in a wide range of lengths, widths and weights. Small footprint fits in any office. Automatic alignment feature assures accurate imprint location. Bottom feed assures proper sequencing of documents and reloading during operation. Imprint location is easily adjusted while imprinting. Paper Size Min Length 5-7/8", Min Width 2.3/4"
Max Length 8-1/2", Max Width 4"
Signature Cover lock guards against unauthorized usage. Non- resettable display audit counter keeps an accurate count of all processed checks. Resettable batch counter automatically counts each signed check for accurate batch totals. Transport keeps continuous forms securely aligned. Signs 240 checks per minute, counts, stacks and secures them in one easy process. Easily adapts to checks in various weights with vouchers on the top, bottom or side. Signature selector has a lock in position for 3 1/2" conventional checks or for 7" voucher style check signing. Side by side, dual signature system available. A variety of imprint designs can be utilized ranging from signatures to seals with an assortment of backgrounds and text for any application. Imprint Size Standard Size .875" x 3"